June 30, 2011 – the last day of June, the mid-point of this year. To all the postaday2011 bloggers, this is halfway! Congratulations! 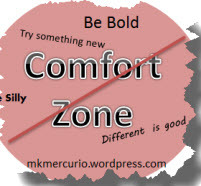 You are doing it – blogging daily, sometimes, often. Inook Sook - Cairn - Marking the Day! Celebrate! Today’s image – Inook Sook I built on Lake Superior – pronounced Inook-Shook in Ojibwe. Inooksooks are used as markers – way markers, reference points, trail markers, directional markers, or to identify and share places and events of special meaning. The spelling I use is from an Ojibwe elder. In English – It’s a Cairn – Wikipedia has interesting info. So, Congratulations, fellow postaday2011, postaweek2011, or weekly photo challenge participants. Celebrate your success. You are still here, writing profoundly or not, writing humor, laughing, or whatever floats your boat or rocks you. I drop-in on some friends to see what they are up to. One friend is homeless in California and only gets to blog once in a while from the library…. And she is one of the most upbeat people I know! Her blog, Birthing your Creative Fire is about what it is like being homeless. One friend is creating a butterfly a day at My Butterfly Year – and another is teaching people about bullying and how to generate kindness instead: Hearts that Care. Many of my friends are very creative… and I prefer joyous, thoughtful, informative, enlightening, educational.. I also found out that it takes a lot of computer time to really read stuff. Maybe I am slow? My computer is slow… I still have not figured out how to get the blogs I like into the side bar and don’t know if it’s the theme I use or my own impatience. My own life in the past 6 months has been a roller coaster – about which I choose not to write, except occasionally. In brief: My phone has been turned off – and back on, a couple of times. My internet has been turned off – and back on, a couple of times. My electricity – same story. In March, my computer died and was resurrected, thanks to a European friend who ordered the part on e-bay and had it shipped to me. In April I changed jobs. In May, I hit a deer with my truck and smashed them both up. Good things: I was unhurt and I have great insurance! For the month of May, when gas prices soared, I got to drive a rental car that got great mileage- a miracle, since I drive 60 miles round trip to work. I lost an old friend, and made many new ones. I have listened to and read umpty-seven online classes and seminars on how to use the internet for marketing, how to improve my writing, how to be braver, how to find the love of my life, how to love the love of my life, how to get rid of the feelings I have for the love of my life, how to parent better, how to love better, how to make more money, how to save money, how to focus more, how to focus less, how write more, how take better pictures, how to say what I want, how to ask, how to give, how to receive, how to eat, how to pray… and how to blog. For today I will simply celebrate and mark this day as halfway to somewhere and looking forward to the ongoing journey of sharing and learning. Is it art? Poetry? Photography? Sharing? Giving? Have a wonderful postaday2011. Celebrate your successes. I am. I’m still here – blogging sparkling, laughing. May your day be refreshing, wherever you are! Dance with the sparkles of your life ~ here now. Calm didn’t last long… at 7:15 a logging truck rumbled by. Followed the loggers all the way to Lake Superior. It only took them 2 hours to load and truck out 2 – 3 double trailers full of timber. I have mixed feelings about logging here. We’ll see if they clean up or just leave the slash… “Slash” is the term used for what is left – anything under 6″ in diameter. In many countries and other states, slash is bundled and processed, becoming bio-mass fuel, creating less demand for fossil fuel. Not here. In Michigan, legislators from the lower part of the state LOVE coal burning electical generating plants… and want to build 6 more to keep up with rising energy demands. Logging creates much needed work here… and yet, somehow it makes me sick to see this beautiful pristine place cut in ribbons, laid waste. May your day be filled with refreshing sparkling honesty. Capturing the image of the Luna Moth was such a gift! Then I was totally blown away by what was visible in close ups… The color and furriness of this beautiful moth was absolutely breathtaking. Creator is such a magnificent designer… I am constantly awestruck and humbled by nature’s designs. on the doorstep at dawn. May your day be filled with beautiful gifts! The adult Luna Moth may only live about 7 days, depending on location and may only produce one generation. Today is the annual turning point in the cycle dance of seasons and time. Summer Solstice. May this day be joyful and light for you and everyone on the planet. Where I live, for the next few days, it will be getting light at about 4:30 am and staying light until nearly 11:00 pm. 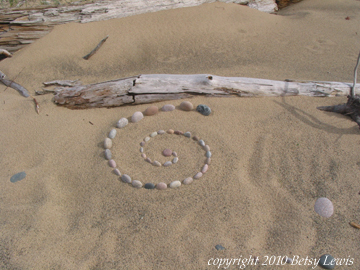 I will celebrate at the beach, in touch with water, rocks, light and the timeless energy and abundance of Lake Superior. Some of my friends are dancing for peace at Thirsty Dance. I miss them and was unable to attend this year… yet I will dance with them at the beach. I will be sharing my joy and sadness and hopes and dreams that humanity is beginning to see the light, that more people will care for people and the planet we share. Some Not so good news about the oceans. I am grateful for the internet and our ability to share around the world. As Leonard Cohen sings, so beautifully, “Ring the bells…There is a crack, a crack in everything, that’s how the light gets in…” You can listen here. So today, I dance, I sing, I love, I share, I let the light in and out. Breathing light -ly. May you share your light with the world! Today is a “between” day… the day between Father’s Day and Summer Solstice. I am grateful for having had my dad in my life for the first 19 years. He encouraged my art, my persistence, my patience, my curiosity. He taught me to be outgoing, fun, friendly. He laughed with us, played with us. He took me to beaches and horse barns and events. I loved him dearly. I know he is always watching, helping, loving and supporting me, even though he left this physical life long ago. About the Labyrinth ~ and how I work. Many questions are asked about the artwork I produce and how I work. Taking time to answer a few, let’s use the Labyrinth as a starting point. How did you find so many stones to match in color, shape and size? The short answer: Keep my eyes open, go where there are a lot of stones. The long answer: I think of the beach near my home as Creator’s art supply store, full of wonderous materials for making art and finding beauty. With 31 MILES of wilderness beach at my feet, it is rich and abundant, filled with colors and shapes. 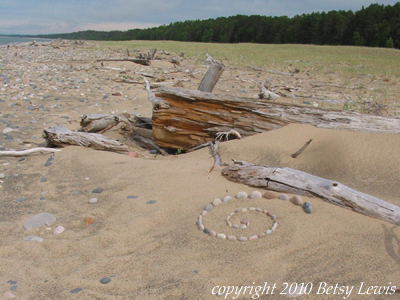 Lake Superior’s beaches offer some of the most colorful stones on the planet. The inventory rotates with storms and wave actions, thus it changes regularly. Often, I think of the beach as “my studio,” a wide open space, full of creativity and a place to “play” with ideas. Short answer: Creator, being inspired by a word, a group, or an experience. Ideas flow easily when I am in touch with Joy. Long answer: The week I created the Labyrinth, I had set aside time to celebrate the completion of Denise Linn’s 28 week Soul Coaching course. There were 700+ participants from all over the world. When I want to fully connect spiritually, I go to the “beach studio,” where the energy flows freely from all directions of the universe. It is where I meditate and express gratitude for all that I am blessed with. As part of this day’s celebration, I knew that Denise was in California, offering a celebration ceremony for the entire group, and we had been told of the date and time. It was during this time I went to the beach. The Labyrinth was not what I had “planned” on doing this day. It just “came” to me. It was cold, windy, and I was wearing snowmobile clothes to be warm in the wind in April. A “perfect” day at the beach! It's easy to find materials at this art supply store! I had planned to simply meditate and perhaps build something small, yet monumental, as a momento of closure for the group and my participation. Searching for large stones to build something simple, I began once again to notice all of the beautiful flat round stones around me. It felt as if each stone represented a participant in the course, and they each ”spoke” to me with color and shape. As I gathered stones, I still had no idea what form they would take. Sitting with a small pile of stones and rubbing my hands together, the North wind was freezing! I had to get moving to stay warm. Then I realized the wind was my ally! It was creating fresh canvases for me to “draw” on. A hawk feather blew near – Hawk – my personal keen eyed helper. I placed the hawk feather upright in the sand, where I first began to build… and it blew away while I was gathering more stones. It only blew a few feet away, to a better canvas…! I stood the feather up once more in the sand, as a blessing to the group and a sign from Creator – build here – do this! And the labyrinth took form… each stone placed, guided by commitment, inspiration, joy and gratitude for 28 weeks of participation with a group of people I’ve never even met in person, but with whom I was strongly connected. The Labyrinth emerged, evolved after that, effortlessly. As each stone was carefully placed, it was as if I was taking another step in the Labyrinth – Walking Stones. When I was finished, I looked for the Hawk Feather – it had gone with the wind! How do you get the stones into such a perfect circle, spiral? Short answer: Practice, practice, practice. Long answer: I decided, at age nine, that I wanted to learn to draw a perfect circle without a compass. I spent weeks, one summer, practicing every day. I drew on newpapers, discarded envelopes, on the backs of letters. I drew with pens, pencils, crayons, chalk on sidewalks, drew in the dirt with sticks. (Today I would probably be carted off and diagnosed with OCD.) I was determined to be able to draw…better! Learning this skill has served me well. I can draw almost anything, with anything, on anything! Did you draw a spiral first in the sand? How long did it take to build the labyrinth? Short answer: A few hours, an afternoon. Long answer: My whole life. Learning to draw, learning to express myself in visual form is an ongoing process of practice, learn, do, be and practice some more. I “borrowed” part of this answer from Alexander Calder, sculptor, inventor of the mobile, the stabile and an artist with a great sense of humor! In an interview, someone asked him how long it took for him to create a simple line drawing on a paper napkin. They had seen him draw it in a few seconds, but when asked how long it took him to make such a beautiful drawing, he answered “A lifetime.” He was in his seventies, I believe, at the time. His answer helped me realize that we bring our selves, our life experiences, our sense of humor, our love for people, AND a lifetime of learning art skills to the making of art. The more I have developed my skills, the easier they are to use. The Labyrinth continues as a project. I will continue to watch it and take more images of it, to see it in different light. Why do you do this kind of art? Then, later, I photograph, over time, letting nature change the image. Different times of day, different light, makes a whole different picture. The wind moves the sand, creating a variety of textures – changes the canvas. I love watching these changes, often very subtle, sometimes very slow. The Labyrinth still exists, at this remote beach, and in an ongoing series of photographs. Questions? Please ask… there may be an answer. Thank you for asking, reading, visiting, enjoying!